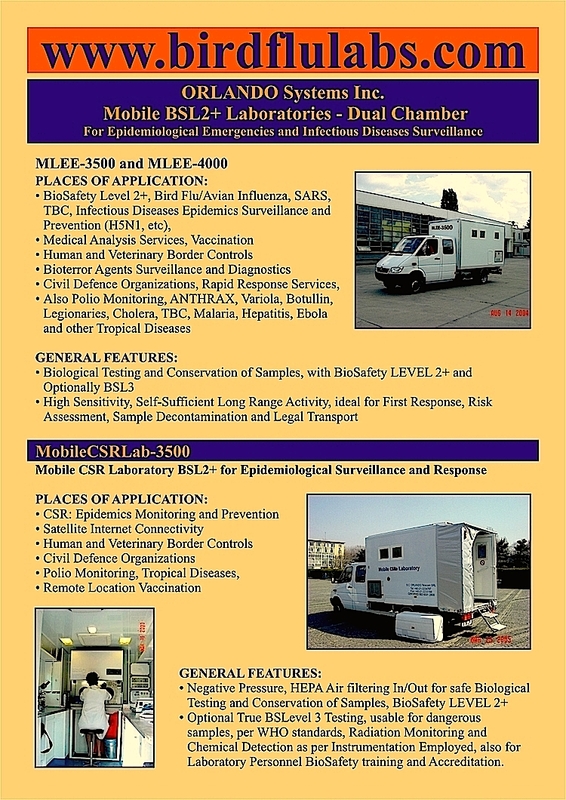 Mobile BSL2+ and BSL3 Laboratories, Veterinary, Health and Food Safety Testing, for FMD, Bird Flu/Avian/FMD, Swine Flu Influenza, EBOLA, SARS, MERS, Cholera, Ebola, Pneumonia, Anthrax, TB, Salmonella, built for Rapid Testing and Safe Sample Handling/Transportation/Preservation with Custody Chain, Biorisk Reduction, Surveillance, Response and Vaccination Programs from ORLANDO Systems LLC, including Chemical Testing of all samples. We are building Truck-Mounted, Container Biosafe Mobile Laboratories for Veterinarian/Food Safety Testing and Health for Avian Flu/Bird Flu, SwineFlu, FMD, EBolad, MERS, Sars, TB and other agents Testing-in-the-field. The Project presented on this site was put together in 2001 by ORLANDO SYSTEMS Inc. originally of Valley Stream, NY, USA, its Romanian subsidiary, partners in Hungary, Italy, France and is continued now by ORLANDO SYSTEMS LLC, NY/NJ, USA. ORLANDO SYSTEMS LLC and the other members of the group, are companies dedicated to the leading edge technology for Emergency Systems Integrations, Mobile, Medical, Veterinarian, data and voice communications. Our Mobile Medical, Veterinarian and Biological BSL3 Laboratories use advanced technology for Epidemics Diagnosis, Monitoring and Prevention. These Advanced Mobile Medical Support Cells combining Mobile Clinics, Labs, Command Centers and Ambulances are available for Emergency or Remote Medical Support. See http://www.birdflulabs.com and http://www.orlandomedsys.com for more information. The company has offices in New Jersey, Budapest, Hungary, Italy, Libia, Egypt and Dubai. ORLANDO SYSTEMS LLC, with a unique blend of expertise (started as Aurimpex Technologies 1991 then ORLANDO since 1995) in the area of Microwave Transmissions, GSM (600 links), CATV, Radiation and NBC monitoring in Eastern Europe, has represented some of the largest manufacturers of telecommunications equipment in the industry. 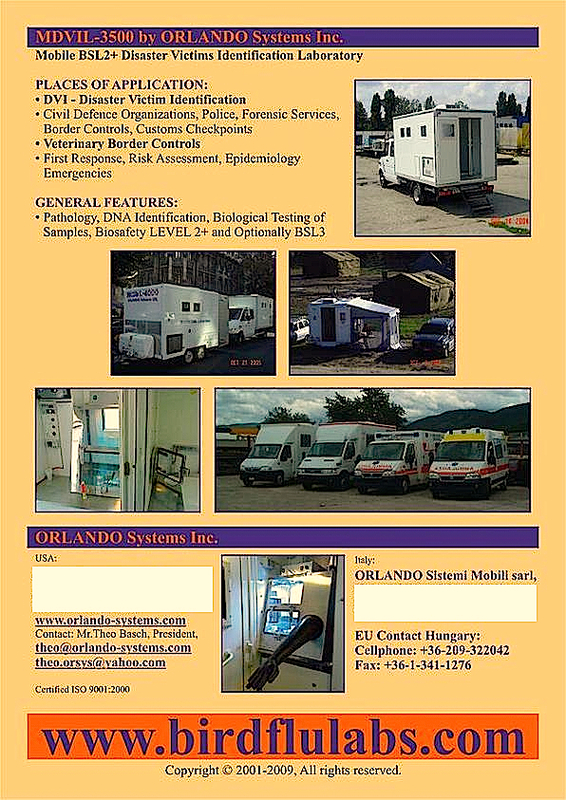 We also Manufacture the Mobile Biological Laboratories showed on this page. We have training facilities available for Laboratory operations and available Medical personnel to support our Projects..
Armored Special Medical Utility Vehicle.